I always regarded the word "stupid" as one that we teach our children not to use when they are young knowing full well that they would learn the appropriate use of the word when they were older. They may even use it occaisionally. Many of you feel the same way. Well, today is one of those times when "stupid" may be more than appropriate to use. The chairman of the board of selectman wants to place an article on the town meeting warrant requiring all department heads with the Town of Sturbridge to be actual residents of Sturbridge. Think about that for a moment. All department heads in the town of Sturbridge are to be residents of the Town of Sturbridge, and if they don't move here, they give up their position. Department heads of the school system, Highway Department, town hall, Water Department would all have to live in town. Why, you may ask? Because they would have more at stake if they lived here, says the chairman. "In an effort to enhance the quality of employee performance through greater personal knowledge of and experience with the community's conditions; and, to develop a greater personal stake in the community's progress, while reducing the potential for absences and tardiness; and to ensure the ready availability of trained and critical management personnel in emergencies; and to foster the general economic benefits which result from spending one's salary in the employing community, while sharing associated local tax burdens and creating a greater sense of ownership within the community; the Town of Sturbridge hereby establishes the following residency requirements." A department head would have a great understanding of the the job they were placed in as the head of their department by living here, says the chairman. If one was promoted, or hired, into a departments heads position one would think that the experience, education, and personality were the prime reasons for the hire, not where they parked their car at night. If one is going to be chronically tardy, or absent for work when they live in East Cowudder, that won't change when they move to 01566. Another reason given is for the department heads to be readily available in an emergency. If they have a car, and the roads are clear, they'll be here if the emergency warrants. Just call them. Being in town doesn't mean they will be available in time of an emergency. All it means is that they will be closer to it. The final reason given in the above statement is the silliest, and I am almost afraid to take it seriously being so close to April 1st. I can't help, but think we are all being pranked. "...to foster the general economic benefits which result from spending one's salary in the employing community, while sharing associated local tax burdens and creating a greater sense of ownership within the community; the Town of Sturbridge hereby establishes the following residency requirements." No, not really, more dumbfounded. Is he actually saying that spending the salary the town pays the department heads here in town, and paying local taxes would create a greater sense of ownership within the community? Yes, that is what he said. He wants the money the town pays its department heads to be paid toward local taxes, and to be spent in town to foster an economic benefit. Whose economic benefit, the department heads, or the towns? So, my working in Boston, and living in Sturbridge, does not allow me to have a greater sense of ownership than I already have for my position, and should be spending my salary, that I am paid by my Boston employer, not in Sturbridge, but in Boston so I can foster a better economic benefit where I am employed. I feel that the Mad Hatter has taken over the tea party at the Board of Selectmen. Reducing an infinite pool of qualified individuals for department head positions to just one, or two that may qualify in town is ludicrous. Taking up roots and moving to our town to preserve ones job. No, not in today's real estate market. Give up ones home, children's schools, neighbors and friends for a job? I don't think so. Unless, there is more to this than meets the eye. Sometimes politics is so opaque we can only wonder what goes on behind closed doors, seldom is it as transparent as the statement, "'Initially, my residency requirement is going to be specific to the town administrator,'" Mr. Creamer said." 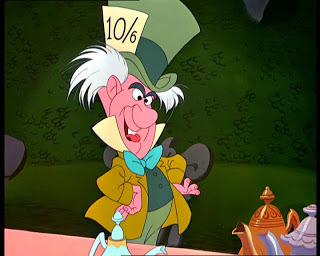 Ahhh, and every once in a rare while, the very reason for all the craziness at the tea party is shared by none other than the Hatter himself. STURBRIDGE _ A proposed bylaw article would force eight current (and all future) department heads to live in town or resign from their positions, if it passes. Shortly after 11 p.m. Monday, Selectmen Chairman Thomas R. Creamer advised his fellow board members that he wanted to place a "Department Head Residency Requirements' bylaw article on the special town meeting warrant. The article would amend the town's general bylaws and require all department heads to live in Sturbridge. In terms of penalty, the proposed bylaw states, "Failure to establish such residency within the established time-period shall be deemed to be a resignation from the office held by the department head". "Initially, my residency requirement is going to be specific to the town administrator," Mr. Creamer said. Currently, eight of the 10 department heads, including Town Administrator Shaun A. Suhoski and Police Chief Thomas J. Ford III, live outside of Sturbridge. The remaining town department heads who are out-of-towners are: Town Planner Jean M. Bubon of Palmer, Finance Director Barbara A. Barry of Palmer, Principal Assessor William B. Mitchell of East Brookfield, Conservation Agent Glenn D. Colburn of Monson. Building Inspector Curt J. Meskus of Charlton, and Town Accountant Jean Joel of Barre. Fire Chief Leonard E. Senecal and Department of Public Works Director Gregory H. Morse are the only two department heads that live in Sturbridge. "I don't know if there is a shared sense of sacrifice and/or recognition of some of the issues that people in this community are dealing with on a regular basis," Mr. Creamer said. "I think everybody in the community should share the sacrifices and the burden that we all have here." Reading the "purpose" of his proposed article, Mr. Creamer said, "In an effort to enhance the quality of employee performance through greater personal knowledge of and experience with the community's conditions; and, to develop a greater personal stake in the community's progress, while reducing the potential for absences and tardiness; and to ensure the ready availability of trained and critical management personnel in emergencies; and to foster the general economic benefits which result from spending one's salary in the employing community, while sharing associated local tax burdens and creating a greater sense of ownership within the community; the Town of Sturbridge hereby establishes the following residency requirements." According to the proposed article, all newly appointed department heads (i.e. after the adoption of the bylaw) as identified in the town's organizational chart must establish residency in the Town of Sturbridge within 12 months of the successful conclusion of their six-month probationary period. In addition, all currently serving department heads as identified in the town's organizational chart must establish residency in town within 18 months of the effective date of adoption of the bylaw. The proposed article defines "residency" to mean the place where the employee normally eats and sleeps and maintains his/her normal personal and household effects. Selectmen will most likely vote on the matter on Tuesday. A majority vote of the selectmen is necessary to place the article on the special town meeting warrant. "It will be interesting to hear the arguments made at next Tuesday's selectmen meeting, as to how it's beneficial to the town and what the selectman who is proposing it is thinking," Mr. Suhoski said. Mr. Mitchell said he thought the proposed bylaw amendment article is inappropriate for a town the size of Sturbridge. In addition, he thinks a regional marketing study on homes needs to be conducted before solidifying the 18-months grace period. "You have a population of 9,000 in town, and to find a specialized position to live in town for the assessor or the finance director or other department head positions -- it's very tricky," Mr. Mitchell said. "It's a specialized type position. There's a lot of training required, and to find it in a community this size is near impossible. So I don't think it's appropriate." Mr. Colburn said he would certainly be disappointed if he lost his job over a residency qualification and, if push comes to shove, he would not move to Sturbridge to keep his job. Mr. Colburn said he was told there were more than 40 applicants for the conservation agent job that he eventually got, but none from any Sturbridge residents. "I can see the point that you certainly want people on commissions to be town residents. … But I think some of the other departments, going outside the town, certainly opens up the pool of qualified people," Mr. Colburn said. "You're limiting the town too much and eliminating a lot of very qualified that could well for this town by instituting this bylaw. I think it's a mistake, myself." Ms. Bubon said she had heard of the proposed bylaw but had not had an opportunity to review it yet, while Ms. Joel said she had no comment. Mr. Ford, Ms. Barry and Mr. Meskus did not returns calls and could not be reached for comment. I would like to see some of the positions require residency. Fire, Police, DPW and town administrator. They are the cores of the town who should reside here. The rest are not really needed. I know that the tax assessor is not a fan of living in town, i wonder why... I do not think it is feasible to have all department heads live here. It would be great if they all did but it is not realistic. Having the big 4 live here is logical since they are critical to the town and also because their inflated budgets (minus the administrator, salary only) should have to share the tax burden. Chief Ford and Shawn are immune to the tax rates. Wonder if this would stand up in a court of law, don't our Department heads have a contract stating working conditions, changing them seems to be arbitary and conpricious. I think this will pass the BOS, 3 to 2 vote by the Chair and his two stooges!!!!! Creamer being the control freak. I agree. It is a very obvious that one person is trying to stack things in his favor by elimininating those he doesn't like. So desperate. A article like this should be amended to not include the current department heads. This would take away the "eliminating those he doesn't like". I do not think this is the case. I believe Mr Creamer's heart in the right place. I have felt this way for a few years and its nothing personal against who we have in office right now. It's about making sure everyone has a stake in the local government, more than just a pay check. If i was applying for a job in a town i do not think it would be out of order to be required to live there. Especially if it was a department head position that pays in the neighborhood on 100k. Someone like the conservation commissioner who is payed less than 50k and who's budget is miniscule compared to police, fire and the schools would not need to be a resident. I would like to see the assessor be a resident, and i am willing to bet that there is more than one person who is qualified in this town to take that position. In a nut shell this isn't about a personal vendetta against anyone its about making a change now that may in a few years actually make a difference in out spending. What is that old adage about the definition of insanity, something about doing the same thing over and over hoping for a different result. What we have been doing over and over has resulted in taxes that are through the roof. Maybe this crazy idea put forth will change us a few years down the line. I applaud any idea that has the potential to decrease our taxes by changing the status quo. Requiring residency of department heads will not decrease our tax rate, nor increase the loyalty and commitment of those individuals. Years ago, the coal mines of Virginia required he miners that worked for them to live close by, in case they were needed in a hurry, and to live in housing supplied by the company. They were paid in scrip, tokens tahiti were only redeemable in the company store thus insuring that the income would stay local--in the oners hands. We all know what finally happened to change those ways back the, today we only need to vote for, or against; in or out. If thare's a probelm with the Town Administrator than the BOS should deal with it head on rather than going around the bush. I wish that I thought Tom Creamer proposed this for the good of the Town, but I don't think that's the case, ask anyone he has disagreed with, he seeks revenge, shuns you or you get blasted on his blog. I use to think he was a nice person, I don't anymore! Sturbridge needs to impliment a budget freeze on spending for 5 years and get our finances in line. Otherwise we are going to be the highest taxed residents in the state for real estate. And even flushing the toilet is going to cost us a fortune. And if these people cannot do their job, do as Donald Trump says. "Your Fired Its not Personal Its Business". So time for the Selectman to put the hammer down to this Finance Committee who have no fiscal responsibility to our Town. Otherwise we will be in the future the next "Detroit" filing for bankruptcy and having the State Bail Us out. Don't laugh we are following their bad habits. I would love to see a budget freeze for 5 years. However, i would like to see it go further than that actually. Instead of freezing, lets got backwards. I really don't want to pay my tax bill at this rate for 5 years, i would like to pay my tax rate of 5 years ago. The only way to get something like that accomplished would be to get an article on the town meeting warrant and get it passed by the voters. Rubber stamp is the way the BOS and Fin Com seem to approach the budget. Almost everything put forth by the department heads is rubber stamped. Just look at the votes on the line items. Rarely are there more than 1 vote against a spending line. The budget is voted on at the Town Meeting...get involved,get friends involved and go vote yea or nay on the budget items. Write to your selectmen as well as here and let them know how you feel. Tom Creamer is always tauting the number of people he hears from on issues, so be heard...just be ready for the backlash! The Finance directer, Town administrator and Town planner should live in Town as their actions directly affect residence. As for water and sewer rates you voted to increase the size of the plant what did you think would happen, the rates will never go down only up and up. Instead of voting yea or nay they should just do a complete freeze and make these people work their budgets to save our town. If you have a person living in this Town or not Living in this town does not bring any more wisdom. But our Selectman, who we vote for should control our spending and just a simple 5 to 10 year budget freeze will be a good start. Then let these people the Department Heads work and massage the figures and earn their big salaries. We have a Town Administrator who was sent out for a paid vacation for showing up late to work and we reward him with a raise after getting a talking to by the Selectman, see if you can do that in your real job with your boss and see how quick you be on the unemployment line. A bylaw should be done by the Selectman to mandate a complete budget freeze and these Department Heads will have to spend some real time to make the figures work and they will with no disruption of service and probably will be more efficent and improved. Instead we say go ahead raise the budget another Million or Two because its only money. Most people in today's economy have taken pay cuts, but in Sturbridge we reward them with a raise and put it on the tax payers back. Never mind this line item budget items to vote on which is just a big joke at these town meetings, just freeze the total budget and let them work the budget items with the money they have. Time for these people to really earn their pay and do the job right. All us taxpayers in our personal life have to live by a budget, its time these people respect the Residents of Sturbridge and they adopt the same. Lets tell the Selectman put a bylaw freezing the spending for the next 5 years and get this town back on track. I couldn't agree more with the 5 year freeze. We pay people a lot of money to manage our town, its about time they manage. Very well said, spread the word i will!!! We voted for renovations at the Town Hall and Center Office Building, we voted for a new Elemtary School, we upgraded our Sewer Treatment Plant, hey folks, the Money Fairy didn't come to Sturbridge and pay for these upgrades. We bought alot of open space, need money for trail improvements. Do you really think that Department Heads think, what the hell, I don't live in Sturbridge so lets see how much we can raise the tax rate? A budget freeze, talk to the School Committees, they have the biggest impact on our tax rate. Watched the B.O.S. meeting last night (Tuesday)A thought came to my mind. If we follow Mr. Creamer's logic shouldn't the Selectmen all be on the town water and sewer system if they are going to set the rates? Maybe they would have skin in the game also. I agree with the last comment. I, like Mr. Creamer, would have liked to keep my septic system so I could control my costs. However, I was forced to go onto town sewer (I still have a private well). To add insult to injury, the town sewer I was forced into accepting utilizes a separate grinder pump/tank which runs off my electric (another added cost over a septic system). One loses use of toilets/sinks during a power outage (no way to determine the level of grinder pump/tank). This "betterment" adds an additional $500.00 plus to my property tax bill and now I will have to pay an additional $190/quarter (increased from $150/quarter)for sewer use. And the town will still charge you that fee when the power goes out and you don't have use of the sewer system! No rebates like the telephone or cable company will give you for interruption in service. For the previous comment--not every citizen can stay at town meeting until a late hour because they need to get up early for work and some can't attend evening meetings at all (shift workers). These expenditures were approved by a select demographic of the community. Board of Selectmen Chairman Thomas R. Creamer, who said he’s “going to champion against any spending, period,” said the board took a very “conservative” approach toward spending at the budget meeting Saturday and selectmen are not going to support any “unnecessary spending” in the community. Let's pull this donkey a bit further down the road - no one holding office in town could send their children other than to the Tantasqua/Union 61 system and, since Bay Path College is in town, no one can go to higher education elsewhere. My wife and I work out of town and try to spend as much as we can in town, but also try to spread it out as best we can! For shame Cpl Creamer! Do brick sidewalks ring a bell??? I do no think they took a conservative approach to the budget. Unless the budget comes in less than last year they have failed to be conservative in my opinion. One of our selectmen has said more than once lately that "we have not, and do not, spend frivolously" here in Sturbridge. Her idea of frivolous is much different than mine. The uproar over the Fire Dept study commissioned by Government Services study group has masked the budget work Creamer has been leading the BOS on for several weeks, but they will be taking the budget line by line up again at thier 4/22 meeting (the night meet...not the Exec Session scheduled that morning which is surely about the Chief's actions (or lack there of it seems). BOS has "redlined" 75% of the budget items in this years FinComm and Town Admin recommended budget; No raises for dept heads, no merit increases. BOS will also recommend against Hiring 3 more cops (on top of the 18 already on staff); $196,000 of taxation for the Capitol Committee budget which includes 2 more police cruisers ($84K) on top of the one in Ford's budget already (he's gotten 11 cars in 4 years); no replacement for the old (20 years) but still fine loader at Recyling Center ($156,000 saved); no new trucks for DPW (another 90K saved...DPW has gotten 11 trucks and loaders in 6 years) and some other goodies. There is a request for some large amount to study the failing floor in the PubSafety Complex, but Creamer, Redetske and Gimas will also likely vote to hold on that and take the money needed out of the 1.9 million in "free cash sitting in the towns coffers. People need to come together, stop bickering amongst one another, taking shots at Creamer, and get behind this earnest effort to take over from a spend-thrift and out of touch FinCom and Suhoski, who, because he doesnt live here, doesnt care what happens to the tax base. His raise in the budget this year along with the bonus he's recommending for himself will total about $125K this year. I support residency for him, Chief Ford, whomever the new Fire Chief will be (likely Senecal will "retire" this week), DPW director. These people should live here so they can respond to emergencies and also be connected with the community they make decisions and budgets for. My two cents.